i have long excluded myself from the live musical equation by pointing out that, as a drummer, i can only be out of time, but not out of tune. simplistically, this is indeed correct, but it precludes the antics of the earnest percussionist from any melodic music-making that might be taking place. other than the enormous drumset employed by terry bozzio, i am aware that drums are generally regarded as unpitched instruments, but this does not necessarily mean that they cannot partake of melodic accompaniment in one way or another. should you be predisposed to the art of drumming, you can search the method books in vain for any mention of tone or timbre and how one may incorporate either into one's percussive meanderings. from day one, and i speak from personal experience as both pupil and teacher, the would-be drummer is taught (or should be) the twenty-six prescribed rudiments. think of them as scales for drums. basically these are all technical variations on single and double strokes and combinations thereof. starting slowly and building up speed over a seemingly infinite period of time will eventually produce accomplished control over how and where those sticks fall on the drums and cymbals. once reasonable facility has been acquired, it's time to marry that to co-ordination between all four limbs, usually the part where the house of cards starts to fall in on itself. grab hold of any method book or instruction dvd, and you are likely to find progressively more technical exercises, placing more and more notes into the phrases expected of the drumming acolyte. strangely, there often seems little concern with conjoining this technical ability with any relevant music to which it may be applied. there is little doubt that having the ability to define polyrhythmic patterns at the drop of the hat is something of which to be proud, but in my experience it rarely endears you to your fellow musicians, who would likely be more than happy with a basic 4/4 beat interspersed by the occasional cymbal crash. i have taught drumming for many a long year and have gone along with the accepted norm: long roll, double stroke roll, five, seven and nine stroke rolls, single double and triple paradiddles and so on, yet have scarcely seen fit to describe any real word situation where those may be used to great effect. pipe band and american corps drumming notwithstanding, most popular music simply requires the drummer to keep a beat. i have never forgotten the advice imparted to king crimson drummer bill bruford, by erstwhile crimson percussionist jamie muir; "think not that the music exists to serve you, but that you exist to serve the music". it has taken me far too many years to fully understand the implications of that advice. as we headed off on holiday in late november last year, i purchased the album raising sand by zeppelin frontman robert plant, and country diva alison krauss. the drumming on this particular recording is the preserve of jay bellerose who manages to accompany every song in a different percussive manner but in so doing, has all but evolved a new percussive language. you'd almost be forgiven for not noticing his contributions, for unlike the bulk of modern drumming, they do not separate themselves from the melodic intent. very much liking what i heard, i searched out other examples of his playing: joe henry, ray lamontagne, sam philips, ramblin' jack elliot to name but a few, and his non-style is consistent throughout. the man has almost re-invented drumming. so what do you do if you're mavic and you've decided not to rest on your wheel, rim, shoes and clothing laurels and expand your offerings to include helmets? do you take a long, hard look at the competition, see what the general trend is, then leap aboard with both feet and join the happy throng? do you continue to play paradiddles, ratamacues and flams or do you become the jay bellerose of the helmet world, all but ignoring current thinking based on dialectic progression over the last twenty or so years, and starting from scratch? 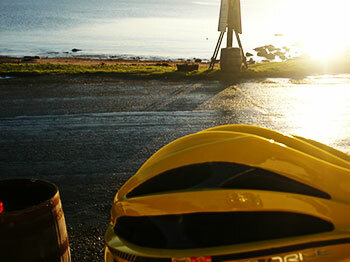 it appears that mavic may well have opted for the latter. three helmets are being offered as mavic's initial foray into an already well-supplied market: the plasma slr (reviewed), the plasma and the syncro. 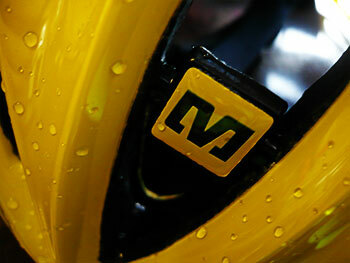 it isn't technically difficult to produce a good helmet; the technology has been around for quite some time, and at worst there was nothing to prevent mavic from sub-contracting an existing helmet manufacturer to produce something on their behalf. however, you win few plaudits and awards for excellence via this route, so mavic's annecy design centre spent three years of research and development along with 'an ergonomical study based on 25,000 head shapes'. if you're like me, you'd expect them to say that anyway; that's how marketing departments earn their crust. 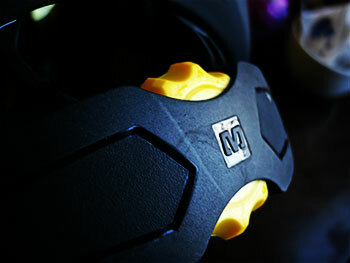 mavic very kindly sent their top of the range plasma slr helmet for review, in the yellow and black colour option. 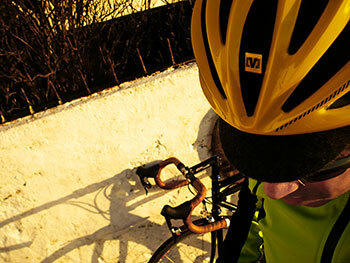 there is nothing that says mavic quite so well as that bright yellow. similar to every other helmet on the market, the vented shell is of expanded polystyrene construction, topped with a hardshell outer to retain integrity should you crash. there is a modicum of carbon fibre reinforcement allowing those vents to be of generous size without compromising the helmet's strength. size options for the uk market are small, medium and large; the helmet in my possession states 52-59cm and comfortably fits atop a winter cap without squeezing what little contents my skull has managed to hang onto. mavic's ergo-hold retention system consists of an inner nylon skeleton culminating at a large adjustable yellow wheel at the back of the helmet to allow for minute fitting adjustment. that marketing hype averred to above is not some vaccuous copy tacked onto some glossy pictures of the plasma; the fit of this helmet is, in my humble opinion, second to none. 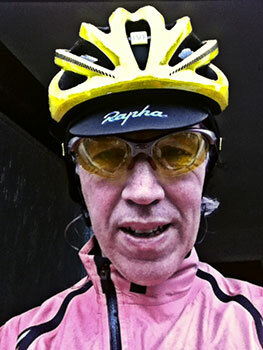 i have worn it with no cap (though rarely in this weather) with a regular richard sachs monikered cap and with two variations of rapha winter cap. in every case it has been a simple matter of tensioning or loosening that yellow wheel to provide an exemplary fit. while being stupid last week and getting myself well and truly caught in 80kph + crosswinds, the helmet moved not one smidgeon, and given the conditions in which i found myself, i had the utmost confidence that if falling over miles from anywhere, i would at least retain what little sense i had left. the plasma is by no means the lightest head covering on the market (it's a good 100g heavier than the recently reviewed giro aeon, but in all honesty those grams are only noticeable when lifting the helmet out of its accompanying vented bag. when worn, the weight is far from oppressive or, in fact, noticeable. the internal padding (ergo-fit pro-pad with x-static) cushions the forward part of the head on every spar between the vents. there is little point in producing a helmet of strength and beauty if it is not comfortable to wear. the rear vents encasing the all-important rear portion of the head, eschew that shiny yellow covering in favour of a matt black finish. if there were a wish list along with the plasma, i'd be inclined to hope for yellow on that portion too; i just think it would look better. that, however, is a wish of superficial aesthetics and not something that ultimately has any bearing on the plasma's functionality. december is not hoted for its unbearable heat, so i cannot vouch for the air conditioning efficacy of those myriad vents, but it would be hard to argue with that which they promise. it was never that likely that a company of mavic's reputation was going to hit the ground in any other mode but running. too much professional reputation was at stake. i figure they've exceeded any reasonable expectations. it's still a helmet in the accepted sense of the genre, but those years examining 25,000 heads have been well worth the effort. that it inhabits the more stylish end of the spectrum is unlikely to harm sales either. it's just a pity i can't see that yellow when i'm wearing it. 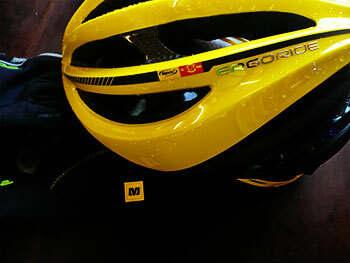 the plasma slr helmet costs around £150 is available in small, medium and large and in either all black or yellow and black.